Home / accessory / A new “first” for me! There are many exciting “firsts” when you are a pattern designer: the first sale of new pattern, the first photo from a bag being tested, the first time see your pattern in a store for sale. Yesterday, I had another first and it was just as great! 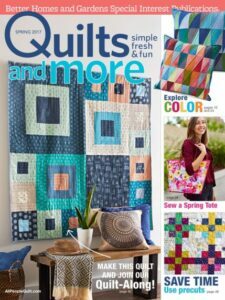 The spring edition of Quilts and More magazine has hit the shelves and guess what…. 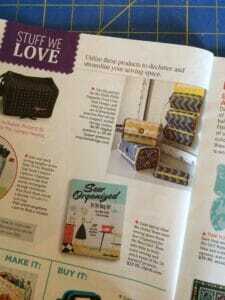 They have selected my Rollie Pollie Organizer as one of the items in their “Stuff we Love” section! You know, I see my designs all the time online, but there is something really special about seeing one in the glossy pages of a magazine! Thanks Quilts and More magazine! New Pattern: The Rollie Pollie Organizer Weekender Bag pattern release New Pattern: The Spectrum Tote is here!